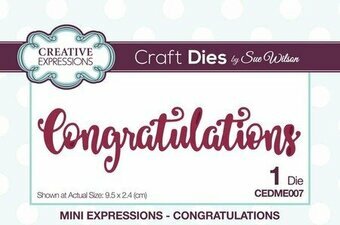 Impression Obsession craft die featuring the word "Congrats". These are US-made steel dies compatible with most table-top die cutting machines. Shout "congrats!" from the rooftop with this irresistible script-style Die-namics. 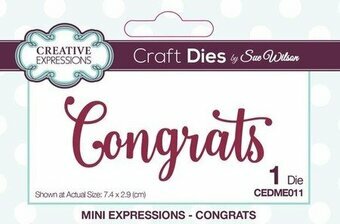 The Congrats Die-namics measures 3 1/4" x 1 1/4". MFT Die-namics, our very own exclusive American-made line of steel dies. Die-namics dies work with your favorite die-cutting machine. Impression Obsession craft die featuring the word "Congratulations". These are US-made steel dies compatible with most table-top die cutting machines. This embossing folder features a Congratulations Collage. Add texture and style to your paper and cardstock projects with Darice's embossing folders! Use for scrapbooking, embellishing and much more. These folders fit most embossing machines. Each folder measures 5 3/4 x 4 1/4 inches. 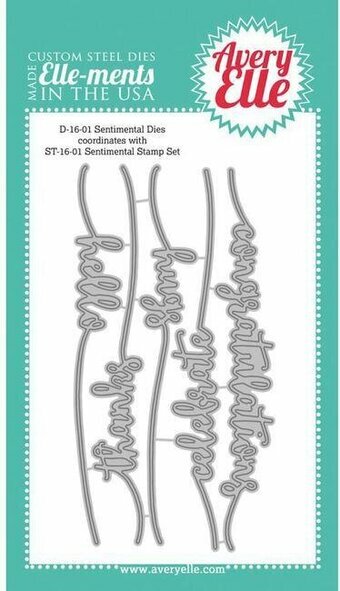 So Many Yays Die-namics includes three "yay" options that can be used as stand-alone greetings or in conjunction with the Yay for You stamp set for even more sentiment-building opportunities. The 3 piece So Many Yays Die-namics includes words measuring 2 1/8" x 2", 2 1/2" x 1 5/8", 3 1/2" x 2". MFT Die-namics dies are our very own EXCLUSIVE, American made line of steel dies. This cute "congratulations" script is a fun addition to your cards and crafts! Lawn Cuts custom craft dies are high-quality steel, made in the USA, and are compatible with most die cutting machines! 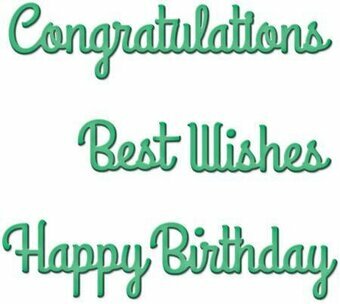 Approximate die size: 3 1/2"W x 1 1/8"H.
This Shapeabilities Congrats Pop-Up Celebrate the Day by Marisa Job Etched Die set would make an awesome addition to your die cutting collection. Spellbinders Shapeabilities cut, emboss and stencil with a single die template. Marisa Job brings us more of her heartfelt personal touches and greetings with her new Celebrate the Day Collection. The word "Congrats" is designed to have a pop-up feature. Such a fun element to add to your project! Approximate Size: 3.30 x 3.15 in.